Diversification can be important for investors. While it can be important, the concept can also be misunderstood. Diversification is a strategy that helps reduce risks in a portfolio. By itself, diversification isn’t expected to increase returns. It is intended to decrease a certain kind of risk. Non-systemic risks are those risks that can limited by diversification. A non-systemic risk would be a risk that is unique to a company. For example, it could be the risk a supplier faces that Apple’s iPhone will not meet expectations. This is a risk unique to that company rather than to the market as a whole. In theory, diversification reduces non-systemic risks. That is because as you increase the number of holdings in a portfolio, you decrease the impact of any single holding. A portfolio with 50 stocks, for example, will generally have less risk associated with each position than a portfolio of 10 stocks. The benefits of diversification are shown in the chart below. This chart shows that as the number of holdings rises (values on the horizontal axis), the risk, measured in standard deviations, decreases (values on the vertical axis). Holding more stocks should reduce the variability of returns. This is not the same as reducing the risk of a large loss. As this chart shows, diversification alone will not offer protection against the risk of a market crash. Many individual investors are concerned about the risk of a large loss, or the risk of ruin. They know that if they lose 50% of the value of their portfolio, they need a 100% gain to break even. If they suffer a loss of 90%, the size of the Great Depression bear market, they need a 900% gain to get back to even. To truly reduce risk, in the way many individuals use the term, diversification across asset classes can be important. As the chart above showed, no matter how many stocks you hold in your portfolio, there is no way to eliminate the systemic risk and that risk can be quite large. To truly reduce risk, an investor can add asset classes. They can add bonds, for example, or real estate to their portfolio. These asset classes are expected to have a lower correlation to stocks and they may not decline in value even when stocks suffer a bear market. This theory was put to the test in 2008, the year when stocks suffered large losses. 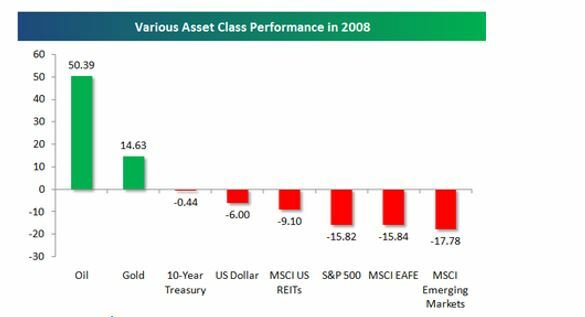 The next chart shows how different assets fared that year. You’ll notice that international stocks fared even worse than US stocks. This demonstrates that international stocks are highly correlated with US stocks. This does not mean there is no place for international stocks in a portfolio. It does mean the risks of international stocks need to be understood. We will address that topic in a future article. In 2008, oil and gold delivered gains while treasury notes suffered just a small loss. Oil and gold can be part of a portfolio but they could also be considered as trading assets rather than buy and hold investments. While they delivered gains in 2008, in many years, both assets suffered significant losses. Treasuries, and other fixed income assets, could be the best way to truly diversify a portfolio in the sense that they have a low correlation to the stock market and they are capable of delivering steady returns unlike gold or oil which are volatile and risky. Fixed income refers to any type of investment where the borrower or issuer is obligated to make payments of a fixed amount on a fixed schedule. For example, the borrower may have to pay interest at a fixed rate once a year, and to repay the principal amount on maturity. Fixed income securities are not like equity investments, or stocks, because a company issuing shares of stock is under no obligation to pay dividends or any other form of income to investors. This makes equities riskier in some ways and riskier investments tend to offer better rewards. Financial planners and stock brokers at full service firms have long advised clients to consider a 60/40 portfolio. This is a portfolio composed of 60% equities and 40% bonds or other fixed income investments which include cash, corporate bonds and Treasury securities. This portfolio has historically delivered good returns. 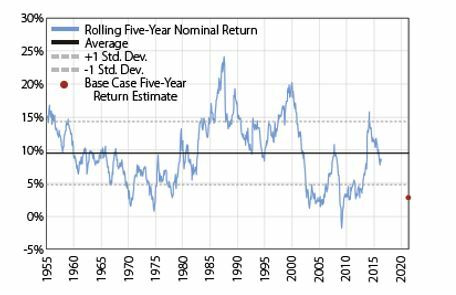 One study in Financial Adviser magazine, a publication for financial professionals, included the following chart which showed rolling returns over five year periods. This chart shows returns since 1959. It assumed the portfolio was created every month and held for five months. There are 738 unique portfolios shown in the chart, each covering five years. Over that period, the average annual return was 9.5%. Of the 738 rolling five-year periods since 1950, only 67 have had a return less than 3% and just one delivered a negative return. The best return was more than 20% a year, although that performance is unlikely to be repeated in the next five years. The 60/40 portfolio is popular but has often been used by individuals with larger portfolios. Smaller investors may not find the balanced portfolio attractive because it is likely to have lower returns than a stock portfolio. This is because the bonds component of the portfolio will have less risk, and subsequently lower returns. Individual investors with smaller accounts could consider using options to create the fixed income portion of the portfolio. Instead of owning bonds, investors could buy calls. This will not provide income but it will provide exposure to bonds and allow investors to benefit from uptrends in bonds. This is an aggressive strategy and could be used with aggressive bond funds. Among the most aggressive bond funds is PIMCO ETF Trust – PIMCO 25+ Year Zero Coupon U.S. Treasury Index Exchange Traded Fund (NYSE: ZROZ). A zero coupon bond pays no interest. The interest is added to the principal each year and the bond pays its full value at maturity. Options also pay no income and closely match the objective of the zero coupon bond which is to track the trend of fixed income investments. For ZROZ, options are available that expire in several months. That means this would require an active management process. Call options would meet this objective. A call option is the right, but not the obligation, to buy shares of the equity later. For ZROZ, call options offer a low cost way to trade. For example, call options expiring in December with an exercise price of $115 are trading at about $8. Each contract covers 100 shares so this would cost $800. This controls an investment equivalent to 100 shares of stock valued at $11,500. If ZROZ moves higher, this option will deliver a gain equal to nearly 100% of the ETF’s move. If the ETF falls, the call option will lose value and could expire worthless. However, if bonds move higher, this ETF will be among the biggest winners and this trade could be attractive for those times when investors expect interest rates to decline. While this options trading strategies is riskier than owning some types of fixed income investments, it could provide the returns available to large investors with 60/40 portfolios. Because of this, it could be a strategy small investors should consider. Small investors could also consider learning more about stocks that offer the ability to deliver option-like gains with large price moves. These are the kind of stocks detailed in the Trading Tips service, The Next Superstock, which you can learn about by clicking here.